Home » Horizon 6.2 » UEM 8.7 is GA! 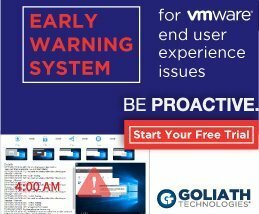 Yesterday, VMware brought 3 new versions of existing products to the GA status. Horizon Flex 1.6, Identity Manager 2.4 and User Environment Manager 8.7. UEM is now able to detect all sorts of session types: PcoIP connections, Blast connections, RDP connections and last but not least Citrix connections. VMware added Support for detecting Client IP/Client Name in Horizon View. As this is also added to Horizon 6.2, you need to upgrade to that version to actually be able to leverage this functionality. Windows 10 is now officially supported (although is kind-of already worked in 8.6). Like the Resultant Set of Policies feature in Windows, UEM now provides extended analysis in the form of Resultant set of UEM items. Pretty cool! Especially when troubleshooting a user’s desktop or application. The output will be stored in the xml format. A new feature is added in the Application Profiler. By auto excluding sections, better profiling results are achieved by providing even better optimized UEM Configuration files for applications. The UEM Synctool (which can be used for devices that can be offline like notebooks) now has extended features for dynamically updating the user environment when updates are synchronized locally. With these new features, VMware is again a step closer in integrating it’s EUC portfolio. The only thing I’m a bit curious about, is if they still have enough material to announce new products and features during VMworld 2015 in Barcelona. Let’s hope so! Previous PostVMware Identity Manager 2.4 announced today!